Three weeks down, can you believe it? I’m sitting here completely in shock that these 21 days have flown by! It’s honestly insane how different I feel in comparison to week one. I really do feel that my mental health is affected directly by my activity levels. If I workout, I feel proud, strong, healthy and confident, and when I go days without it, I feel pretty down, defeated and I can be pretty hard on myself. It’s something I’m working on, but it really reminds me how important this is for me. I see how much I change when I’m working on bettering my health. If you missed week one’s review, make sure you give that a read first! I go into more detail explaining what Core de Force is all about! 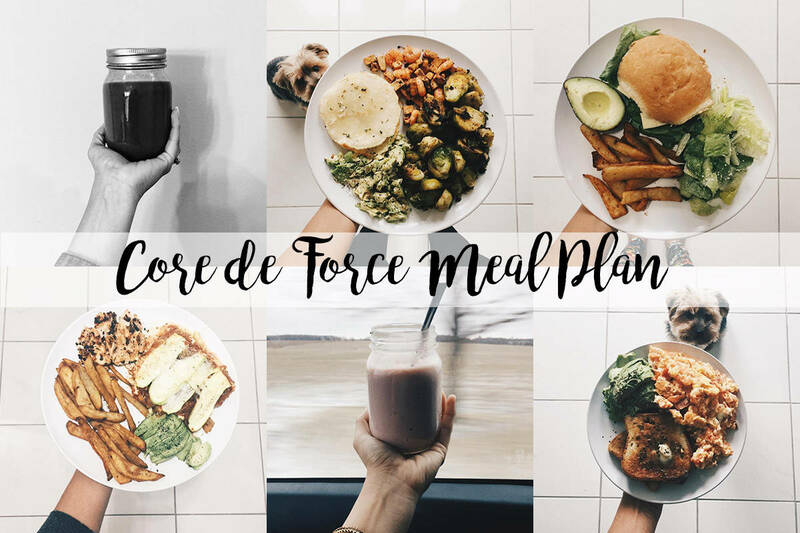 Core De Force – Week One Review . 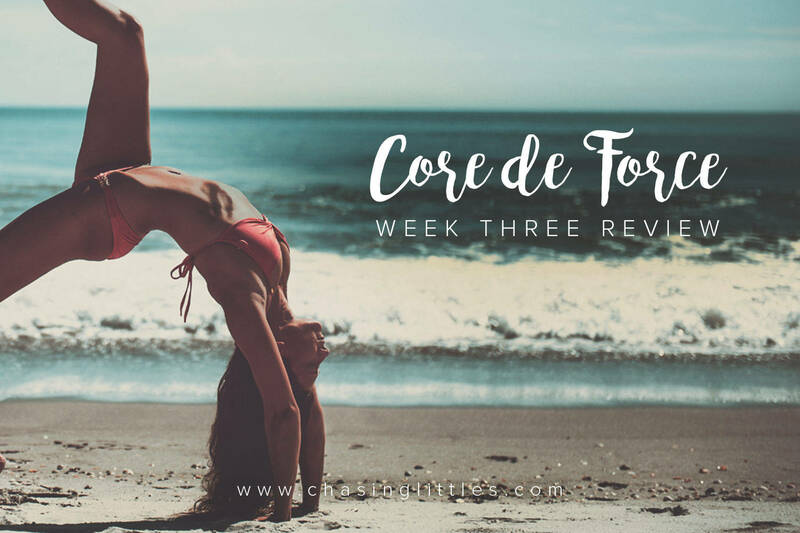 And to follow that, here’s Core De Force – Week Two Review . I have a goal this year to workout for 100 days in a row. And I’m now almost a quarter of the way there! I can’t believe I’ve stuck with it every day! Basically, Core de Force has slowly become one of my favourite programs. I love the intensity, and I looooove the results. Week three of the program is rough!! They were just warming us up before. This is the greatest thing I can say about this program. It grows WITH you. You’re not trying to hit 10 reps or 12 reps, you’re trying to fit as many as you can before the bell goes. So in week one, you’re more comonly slower and weaker than in week three. So although it could seem like it would get easier, you now can move faster and fit more reps in, which is extra work you weren’t doing before! Hence why it gets tougher too. Not just that but there are so many variations you learn on how to make something already hard like a push up even harder! Love it. Ok, let’s get to the week review. Here’s how week three looked like. Total Inches LOST: 1.25 inches lost this third week! It still shocks me how much I can shape my body by working out from home and eating REAL food. Total pounds LOST: No pounds lost, but honestly at this point I’m not sure I have much more to lose, toning will happen and inches will continue to shift and drop but it’s amazing to see it in action. Week 3 we went pretty simple again along with a few favourite recipes from Fixate that keeps the portion fix in mind! I share my complete meal plan so that you can see every step of the journey. This is a meal plan with the Portion Fix Containers in use that come with this program! It’s super simple so my portions are easy to follow with these colour coded containers! Monday – MMA Power (47 minutes) + Core Kinetics (16 minutes) – 12 rounds my friends, 12 rounds of MMA explosive moved. Fast paced cardio, but the rounds fly by. Get ready for some jump rolls! Core Kinetics is intense but so amazing for really forcing you to engage your core, love those 16 minutes just hard after 47 minutes of intense work! Tuesday – Dynamic Strength (47 minutes) + 5 Min. Core on the floor (5 minutes) – Low on impact, but high on intensity. You can really feel yourself carving out your shape with all the twists! 5 Minutes of core is basically a 5 minute plank with variations, some side planks, plank steps, plank everything. Get ready to feel that core BURN. Wednesday – MMA Power (47 minutes) + Core Kinetics (16 minutes) – A repeat of Monday! Work it! Thursday – Power Sculpt (36 minutes) + 5 Min. Core on the floor (5 minutes) – total-body burner. You will feel this everywhere and with the mixture of interval training, Endurance will be built! And as usual 5 minutes core on the floor is killer. I have not been able to stop taking small breaks through this one. Saturday – Dynamic Strength (47 minutes) + 5 Min. Core on the floor (5 minutes) – Repeat of Tuesday! Nothing easy just because it’s a weekend! Um, that it’s been 21 days and i’m still showing up. Huge win. Period. Didn’t stop even on the days where I was in pain from cramps. Just pushed through with lots of water! No excuses! You make the process of healthy living and exercising very easy. Thanks to your useful meal ideas and workouts, keeping my body fit became a piece of cake, Mariangelica. Thanks so much girl! I appreciate the love! I am so happy you found these ideas helpful! The food is the hardest part for some people, but it’s the things that gets you the best results!